With the fantasy football season behind us, it’s time now to start the process of looking back. We’ll turn our eyes ahead very soon, but it’s helpful to look back at what got us here and see what worked, what didn’t, and what we can learn from for the future. I wrote a pair of preseason prediction articles that exhaustively covered every major opinion I had for the 2018 fantasy season. Beyond just offering that advice, I had two goals. The first was to be accountable for my predictions and hopefully learn from them. The second was to assess whether my level of confidence in my predictions was at all related to their likelihood of coming true. To both of those ends, I will be reviewing each prediction. Today, I’ll cover the AFC. Gordon couldn’t play all 16 games like he did in 2017, but he was top-five at the position with 22.6 PPR points per game. That qualifies him as top-tier, and with his YPC jumping to 5.1 to better align with his historically positive Yards Added totals, he looks like a good bet to stay there. 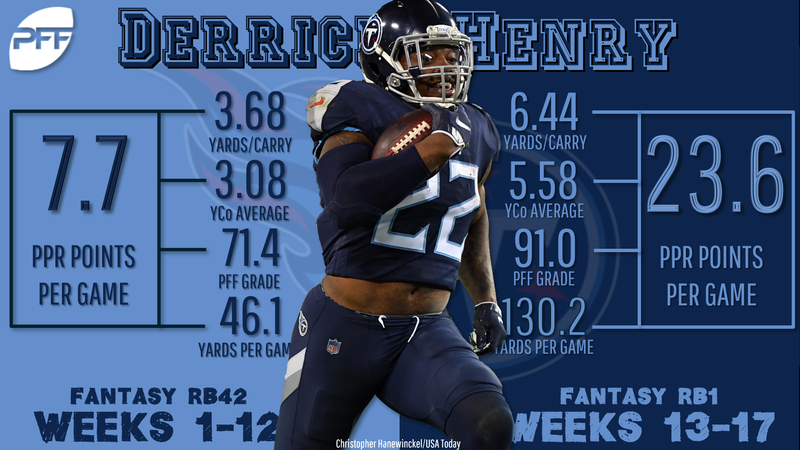 Collins maintained his moderate per-game fantasy scoring from his breakout 2017 thanks to 8 touchdowns in 10 games, but his exceptional yards after contact numbers regressed while he continued to fumble. The timing of his foot injury meant he missed the Ravens’ Lamar Jackson-led rushing revolution, but it’s hard to envision him overtaking Gus Edwards and Kenneth Dixon in the offseason. It almost all came in December, but Henry did set new career highs with 215 carries, 15 receptions, and 12 touchdowns. That success should finally free him of a time share in 2019. Similar to in 2017, Lynch was close to average with 4.2 yards per carry but way above average with 26 Yards Added on 90 carries because he overachieved on a difficult set of carries that were weighted toward third-and-short and goal-line tries. The Raiders clearly agreed with my assessment of his ability because he took 69.8% of the team’s backfield carries when he was healthy in September and early October. A Week 2 setback to his preseason hamstring injury delayed Mack’s full return to Week 6, but from that point on, he took 64.4% of the Colts’ carries and was an RB2. That will likely be his ceiling in 2019 with Nyheim Hines playing the Tarik Cohen role to his Jordan Howard. Fournette was again an efficient pass catcher with 13 RecYards Added on 24 catchable targets in 2018. However, he duplicated his 2017 rate of 2.8 catches per game and played five fewer games. Now with a track record of injuries and uncertainty as to his relationship with the Jaguars, he feels further from a workhorse role now than he did at this time last year. This looked like a terrible prediction when Hyde had 120 touches and 5 touchdowns over his first six weeks with the Browns, but the reason I made it in the first place was that Hyde’s lack of efficiency didn’t justify the continuation of so heavy a workload. His trade to the Jaguars threw a spotlight on his shortcomings as Nick Chubb outplayed what he had done in Cleveland and Fournette played ahead of him in Jacksonville. Anderson comfortably led all Jets receivers with 160.4 PPR points this season, but that was nowhere near WR2 status. Moreover, Anderson, Quincy Enunwa, and Jermaine Kearse all fell between 46 and 48 targets in the nine weeks that all three of them played. This looks like a heavily distributed offense entering 2019, which makes sophomore quarterback Sam Darnold the likeliest breakout player. Danbert Amenson wasn’t a bad deeper-league option with 147.6 PPR points for the fantasy owners who started Wilson in Weeks 1-7 before he fractured his hip and Amendola for the rest of the season. The problem is that Wilson’s 155-yard, 2-touchdown outburst in Week 6 was the signal for most fantasy owners to start him, and then his season ended one week later. I’ll be even more bullish on Wilson specifically next season after he added an incredible 49 yards on just 30 catchable targets this year, but this prediction was incorrect. Yards Added continued to like Cole the best of the team’s receivers, but the Jaguars certainly did not. 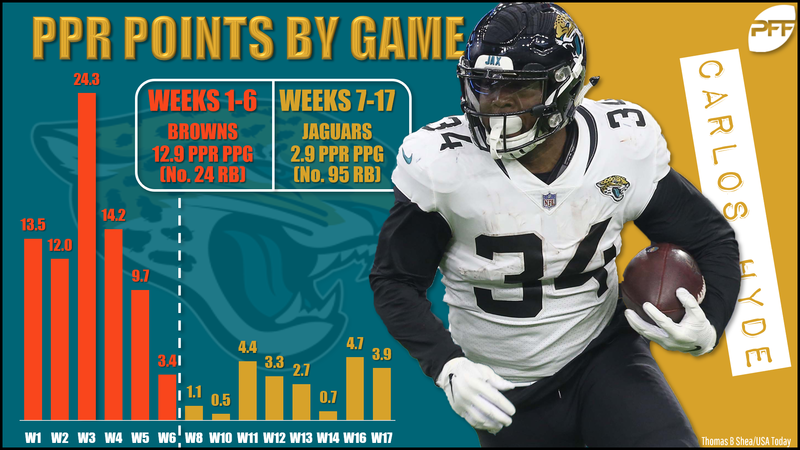 Dede Westbrook and Donte Moncrief didn’t exactly light it up, but both had more targets, receptions, yards, and touchdowns than Cole’s meager totals. The Jaguars will need a change at quarterback before you can consider any of their receivers a 2019 sleeper. Nelson finished tied for 46th among receivers with 10.3 PPR points per game, which was in line with his ADP as the 40th receiver taken in PPR formats. That makes this prediction technically untrue, but he fell way short of a rebound to the 1,200-10 heights that I contend motivated his draft position. He certainly won’t be in the top-40 ADP next year. Drake saw his standout 4.3 yards after contact per attempt from 2017 regress heavily to a middle-of-the-pack 2.7 this season. Since Drake didn’t start ahead of super veteran Frank Gore, it seems unlikely that he would start ahead of sophomore Kalen Ballage next season after Ballage’s strong December performance. Breakout quarterback Patrick Mahomes is largely responsible for the realization of this prediction, but Hill was also one of the positional leaders with 38 Yards Added. Hill is the rare player who can provide consistent fantasy scoring despite a high average depth of target. He should be a candidate for the top-five again next year. Miller comfortably eclipsed this benchmark despite a pair of missed games and actually enjoyed his most efficient rushing season of his career thanks to a 3.2 yards-after-contact-per-attempt mark that was half a yard better than his previous best. I fear that was a fluke, but Miller is still young enough entering his age-28 season to carry decent value in dynasty and keeper leagues. Benjamin scored one touchdown this season, which is so far short of this prediction that it’s hard to settle on a single root cause. The most instructive are his inefficiency — he was in the 15th percentile in Yards Added per catchable target — and a perceived lack of effort, a combination that makes it unlikely he will return to fantasy relevance in the future. This was technically true as Brown led the team with 715 yards, 5 touchdowns, and 144 PPR points, but those totals weren’t far ahead of those of Michael Crabtree and Willie Snead. Distressingly, Brown was inside the top 30 at the position with 13.2 PPR points per game over the first 10 games with Joe Flacco behind center and outside the top 100 with 3.6 PPR points per game after Lamar Jackson took over. Brown would likely need a new team to recapture his fantasy relevance. Green continued his troubling trends of inefficiency and injury, but that didn’t cut into his heavy volume and touchdown scoring that made him 10th at the position with 18.7 PPR points per game in the first half before his toe injury. Moreover, Ross failed to rebound from an injury-plagued rookie season and was way less efficient than Green, costing the Bengals more than a yard per catchable target. My optimism for Andrew Luck led to a pair of Colts predictions, but hopefully you followed the next one instead of this one. Grant had the early opportunities with more than 6 targets per game over the first six weeks, but ineffectiveness led those to dry up, and he failed to pull 4 targets in any of his final eight games. Ebron dramatically overachieved his ADP as the 17th tight end with a fourth-place PPR finish. His 13 touchdowns were more than he scored in his four seasons with the Lions and are most directly responsible for his fantasy success. 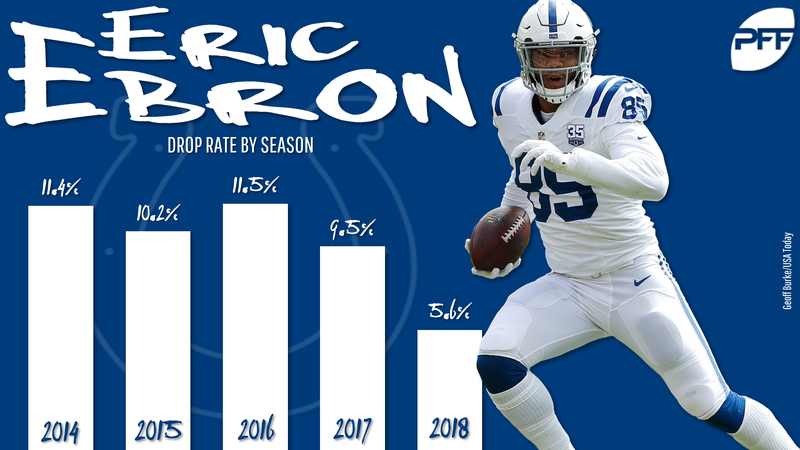 However, Ebron has dramatically cut his traditionally high drop rate over the last two seasons. I think it’s finally appropriate to consider him a top talent at the position. The Ravens threw 23.1% of their passes to tight ends this season and 27.5% after Lamar Jackson became the starter. That’s near the top of the league. However, Hurst suffered a stress fracture in his foot in the preseason which sabotaged any chances he had to make an immediate impact this season. With fellow rookie Mark Andrews turning in an impressive receiving season, it will probably be difficult for either player to rise to fantasy prominence in 2019 even in the TE-heavy offense in Baltimore. Hill tore his ACL on his fifth touch of the season in Week 1. That forced the Patriots to rely on undersized running back Sony Michel and fullback James Develin near the end zone. Michel finished the year with a poor 2.6 yards after contact per attempt, which I think leaves this role a question mark for the team in 2019. LeSean McCoy had his worst season by pretty much every measurement, and that offered Ivory several opportunities to break out in fantasy. But despite six games with 10 or more touches, Ivory punched in just one touchdown. I doubt either player will be the back to own on the Bills in 2019. I want to review my NFC predictions before I draw my final conclusions, but if the AFC predictions are any indication, my prediction confidence makes a big difference. Four of my five “very confident” AFC predictions came to fruition, which is the same total I managed in the other three confidence categories combined. Those latter picks still had some value, especially since so many of them skewed toward the bold side and wouldn’t have required much if any draft capital. But maybe confidence is an appropriate metric for how quickly one should be willing to change course when a prediction looks bad early.